Taken on NYE at a local restaurant/lounge. The place has a ton of cool little details, and the lamp caught my eye that night. Minor curve adjustments with noize ninja and a soft smartsharpen. Hello from the Critique Club! Quite a nice shot you've got here! Many of your comments are right along the lines of what I would say too :-) This is a lovely fixture with shapes inside a shape....very good choice for this challenge. The light from the fixture seems to glow in a very pleasing way! The muted colors in the background serve the picture well-most notably the diagonal line, which helps to draw the eye. My only suggestion for improvement would be to use that diagonal to cut the photo from corner to corner, making two triangles as well. You may have thought of that and avoided it, due to the frame in the lower right hand corner? All in all, quite lovely and a very good choice for this challenge! Good detail and great idea. I might suggest removing the picture from the wall before the shot(if it is a picture frame) and cropping a little off the top and left. I do like the the shift from the brown to the burgendy . The shape texture and light are relaxing to look at. Beautiful photo! Great shot, I love those lamps :) The line in the background is a little distracting but good perspective for the shot. Certainly a beautiful fixture, very well photographed. I love the diagonal which draws you back to the subject. 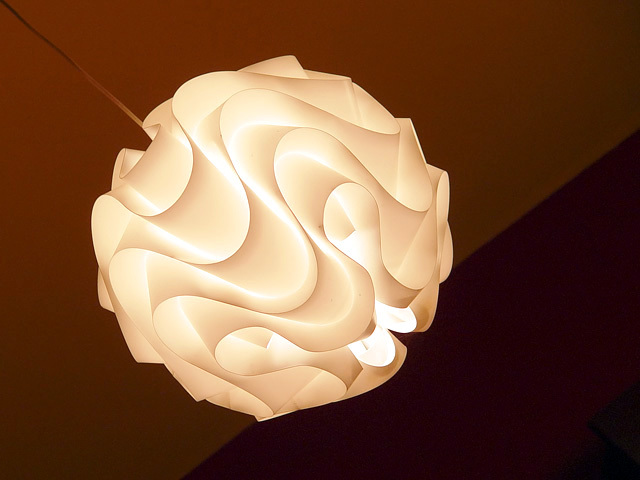 The pattern of the lamp is a wonderful element here, without overhelming the basic sphere. It doesn't need a title; let the viewer choose! Great technique on a technically difficult capture. I really like this one. Very intriguing light fixture. Like the gradations & shapes they create. I don't mind the blown out highlights. Interseting subject. Well exposed. Not sure about comp though. The main subject is what really captures and holds the eye's attention. Love how you effectively captured the light coming off this light fixture - the light flows off and accents the curves of the piece as well as the shadows. I have two critiques on this piece. First the stem of the light fixture is too distracting - the more you can eliminate from changing the angle the better it would be. Speaking of changing the angle if you had angled the shot such that the main light fixture remains in the center with the background showing "two triangles" dividing the rectangle format you would have captured a multitude of interesting shapes that all complimented each other. Had you angled the line between wall and ceiling to match up with the opposite corners of the rectangle format of this photo it would have created the illusion of a trianglated background - one light brown the other chocolate brown. Proudly hosted by Sargasso Networks. Current Server Time: 04/19/2019 02:18:04 AM EDT.